CWDM, 'Coarse Wavelength Division Multiplexing', refers to the process of combining multiple singlemode wavelengths into a single, fibre optic cable. Depending on the transmitters, receivers and transceivers used, signals can be transported in either or both directions simultaneously. Each wavelength can be used to transport a different audio, video or data stream, or a combination of all three in the case of audio and data embedded in an SDI signal. The ITU- G.692.2 standard defines eighteen wavelengths from 1270nm to 1610nm, with a channel spacing of 20nm, which can be used within a CWDM system. The use of yellobriks fitted with CWDM SFP modules overcomes the restrictions involved in the distribution of Ethernet, serial and GPI data signals over long distances and allows up to eighteen optical signals to be multiplexed on a single fibre over a distance of up to 40km. 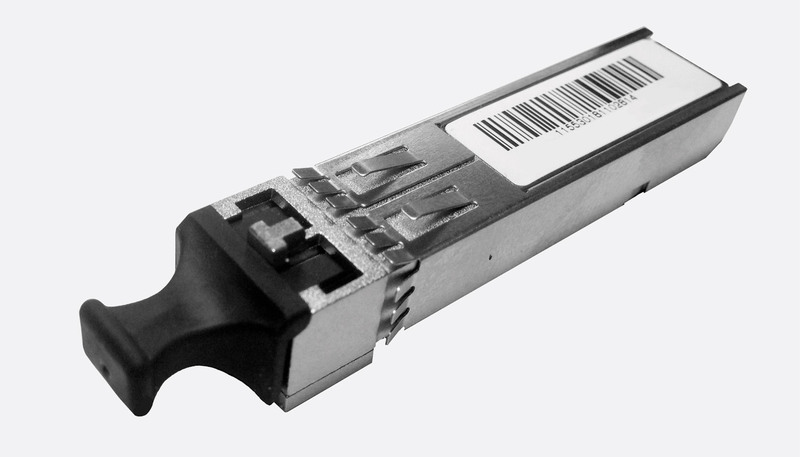 80km SFP modules are also available, please contact Technical Support for details. These modules, part of the Yellobrik range manufactured by Lynx Technik, extend electrical communications circuits over distances of up to 40km. The Ethernet extender supports up to gigabit Ethernet, the serial and GPI unit supports RS422, 432, 485 protocols combined with dual, bi-directional, GPI signaling; both require a duplex fibre link. Lynx yellobrik CWDM Ethernet, serial and GPI extender modules are fitted with an SFP (Small Form-factor Pluggable) 'cage' into which a CWDM SFP optical transceiver module must be plugged. They can be readily installed or hot-swapped without tooling, or opening the yellobrik module. Modules may be used alone, or mounted in an optional rack-mounting frame. Note that there are several incompatible SFP pin connection protocols and quality and reliability varies enormously between SFP manufacturers. It is therefore recommended that only Lynx Technik SFPs are used with yellobrik modules. Fibre connections: 2x fibre optic ports, one transmit, one receive, singlemode LC/PC duplex connection. Transmit wavelength: Selectable CWDM SFP transceivers between 1270nm and 1610nm transmit wavelength, +2dBm. Receive wavelength: 1260 to 1620nm, -3dBm to -23dBm. Included accessories: All Yellobrik modules are supplied each with a plug-top power supply with UK, US, Australian and European plug fittings and hook and loop mounting pads. Optional accessories: Power adapter cables for 12V working, alternative power supplies and a rack-mounting frame for to 14 yellobrik modules are available. Please see Lynx Yellobrik Power Supplies And Mounting Accessories. The ODT 1540 is a multi-function module which, when used with another ODT 1540 in the remote location, will extend the reach of a serial connection, as well as two GPI, general purpose interface, circuits, up to 40km over two fibres. A single RJ45, electrical, serial connection can be configured for RS232, RS422 or RS485 serial standards. A separate RJ45 connector is provided for two electrical GPI inputs and outputs. Serial communications and GPI are transmitted and extended over the same duplex fibre link. The ODT 1540 is 'completely agnostic to the serial protocol used, and supports all standard protocols and proprietary protocols at data rates from 300 to 460K Baud (auto sensing and auto adjusting)'. The integrated DIP switch provides control over the serial mode of operation, with selection of the serial standard, serial termination, RX/TX crossover and RS422/485 data direction (automatic or manual). Data activity LEDs are provided for the serial port and the GPI port under the respective RJ45 connectors. The ODT 1540 also supports 'mixing and matching of serial standards'. For example, the transmitting module can have a RS232 input, and the receiving module can be set for RS422 output. The ODT 1540 is '100 percent plug and play, hot pluggable and no special software drivers are required'. Serial connections: EIA/ETA RS232C / RS422 / RS485, RJ45. Maximum number of electrical nodes for RS422/485: 25. ESD protection for up to 26kV. GPI connections: 2x inputs, 2x outputs per module. GPI inputs: External passive closure between pins (short) to trigger, maximum input switching frequency 25Hz (50 operations / second). Input insulation: 3.75kV. GPI outputs: Internal contact closure (relay), maximum switching frequency 25Hz (50 operations / second), maximum switching power 220 VDC, 0.25A or 250V AC, 0.25A. Output insulation: 3.75kV. Does not include a fibre SFP module, an OH-TR option MUST be selected from the price table below. The OET 1540 is a compact three-port Ethernet switch, designed to extend the reach of electrical Ethernet signals over long distances using a constant (fixed) high speed 1Gbit/s optical transceiver speed. When paired with another OET 1540 at the receiving end, the wired Ethernet signal can be extended over distances up to 40km using two fibre links. The fibre port is fully IEEE 802.3z compliant, so a single OET 1540 can be combined with any IEEE compliant switch or network adapter provided that the equipment interface supports the fibre type, and the transmit and receive wavelengths. The modules have two standard RJ45 electrical Ethernet ports and a duplex fibre port; they are three-port devices. However, when a pair are connected together by a duplex fibre connection, the combined pair act as a four-port Ethernet switch. Each electrical Ethernet port can be set for automatic speed detection, 10, 100, 1000Mbits/s or forced to 10Mbits/s and each port can use auto crossover detection or be forced manually if needed. These functions are available using a DIP switch. LEDs indicate port speed and activity for the electrical ports and TX, RX active for the fibre port. These are available in eighteen wavelengths according to ITU-T G.694.2. For full details and specifications of CWDM SFP modules, see Lynx Yellobrik Fibre Optic SFP Modules - TX, TT And TR - CWDM.